This is the second time such an event is taking place in Mumbai, India’s financial capital. Prior to the BRICS summit and the annual Russia - India summit that will be held in Goa on 15-16 October, the second BRICS annual football tournament among schoolchildren was held if Mumbai last Sunday. 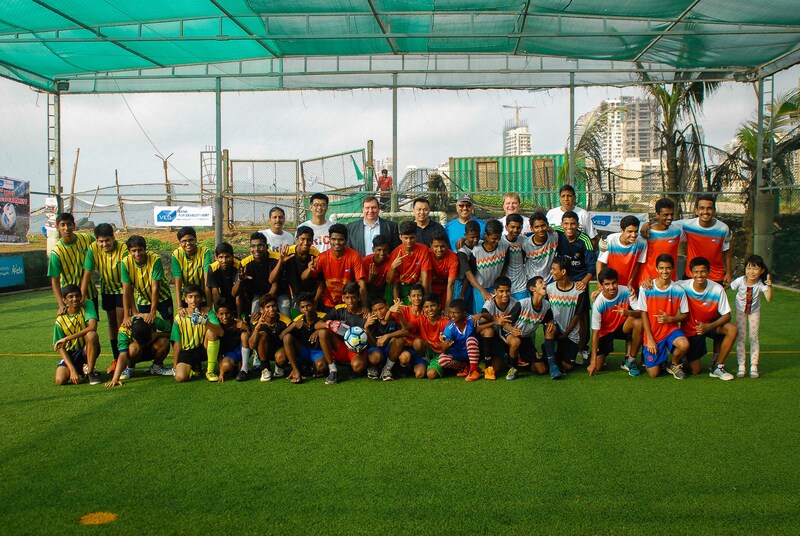 Carrying on an initiative launched last year, the Vnesheconombank (VEB), Russia’s state-owned development bank, and the Russian Consulate General in Mumbai, organized the second BRICS football tournament for schoolchildren in Mumbai. A total of five teams, to replicate the five BRICS nations, played in the tournament held at Priyadarshini Park in South Mumbai. Each team wore a uniform carrying flag colour of each BRICS nation. VEB designed the uniform specifically for this event. Not only schoolchildren took part in the tournament. Friendly matches were played by members of diplomatic missions of five BRICS countries at the end of the tournament. The team of diplomats played with each of the children’s teams, winning over some and losing some matches. The tournament culminated in the teams being honoured by chief guests of the event, by Yaduvendra Mathur, Chairman of Export-Import Bank of India (Exim Bank), Andrei Zhiltsov, Consul General of Russia in Mumbai, China Deputy Consul General Li Yuanling and Phillip Mtsweni, Consul (Economic) of South Africa in Mumbai. “Over the past eight years, BRICS has become a very big global event. This year the presidency of BRICS is with India. Events like this could bring the people of five countries together so that there is more people-to-people engagement and all five countries could grow as a stronger unit in the world economy, and people from all five countries can live together more closely,” said Exim Bank Chairman Mathur. “You all are wearing the colors of BRICS countries which makes you not only the citizens of Mumbai, but citizens of the global community,” he said addressing the young footballers. This is the second time such an event is taking place in Mumbai, India’s financial capital. The idea to organize the football championship under the BRICS banner, was born in July 2015 when, during BRICS summit at Ufa, Indian Prime Minister Narendra Modi proposed setting up a BRICS sports council and holding annual football tournaments. The first edition of the official BRICS U-17 Football Tournament will be held in Goa from 5th to 15th October 2016, to coincide with the 8th BRICS Summit. Under-17 teams from India, Brazil, China, South Africa and Russia will participate in the football tournament organized by All India Football Federation (AIFF), appointed to handle the technical aspects of the event. “BRICS unites five countries that are very diverse in many aspects, including in their preferences in sports. So we have countries with one of the world’s best footballing histories to countries that don’t really play football much. So this can be a chance for the latter to develop the taste for this game. As for the India, there are states like Goa, West Bengal and the North East, where people love playing,” Zhiltsov, the Russian Consul General in Mumbai, told RIR. Mathur noted in his interaction with RIR on the sidelines of the tournament that BRICS countries and their development banks have already been cooperating closely on a range of issues, both bilateral and within the BRICS grouping. Taking this cooperation to the new dimension of sports or culture could make the overall interactions between the development organizations as well as BRICS leaders and decision makers stronger, he added. Alexander Perminov, VEB representative in Mumbai, said BRICS was on everyone’s lips as India is now presiding over the grouping. Even schoolchildren were able to name all the BRICS countries correctly. Perminov added that VEB has been organizing annual sport event "Partners of the XXI century" for past many years in Russia. “This tradition contributed to the idea of having such kind of events in India, where our bank is represented for almost 40 years,” he said.